Elizabeth Fisher Read, a scholar and one of Eleanor Roosevelt's earliest female political and feminist mentors, was ER's personal attorney and financial advisor during the first part of her public career. ER credited Read and Esther Lape, Read's life partner, with playing an important role in her education as a political activist. The two women also formed the nucleus of what eventually became ER's support network of close female friends devoted both to her and to the causes she supported. Their three-way friendship endured until Read's death in 1943. Thereafter, Lape and ER continued to see each other regularly until ER's death in 1962. Born in New Brighton, Pennsylvania, in 1872, Read graduated from Smith College and the University of Pennsylvania Law School. An active participant in the woman suffrage movement, she typified what in the 1920s was known as "the New Woman"– independent, financially self-supporting, politically active, and socially emancipated. She lived with Lape, an educator and publicist, in Greenwich Village and worked for a variety of social and political causes including the New York state branch of the League of Women Voters. She also practiced law and was director of research for the American Foundation, a private organization dealing with national and international public affairs issues, which Lape directed. In addition she wrote a book on international law, translated and edited a book on the World Court, and helped Lape edit a book on expert medical testimony. Read first worked with ER when the latter became director of the league's national legislation committee in 1920. At the time Read and Lape were editing the group's weekly legislative review, City, State and Nation. Impressed with one another's skills, abilities and brains, the three women quickly cemented what became both a political partnership and a warm friendship. Among their professional projects was a multiyear effort to encourage American participation in the World Court, an organization that had been created as part of the League of Nations. At their Greenwich Village home, Read and Lape created an atmosphere that reminded ER of her schooldays with her teacher, Marie Souvestre, and the three women spent many hours there reading poetry and discussing political issues. As first lady, ER rented a floor in Read and Lape's building, which she used to escape the pressures of her public position. The three women also spent time at Salt Meadow, the country house Read and Lape owned. Read died in New York on December 13, 1943. Beasley, Maurine, Holly C. Schulman and Henry R. Beasley, eds. The Eleanor Roosevelt Encyclopedia. Westport, Conn.: Greenwood Press, 2001, 429-431. Cook, Blanche Wiesen. Eleanor Roosevelt: Volume One, 1884-1933. New York: Viking Press, 1992, 292-299. Lash, Joseph P. Eleanor and Franklin. New York: W.W. Norton & Co. 1971, 260-261. 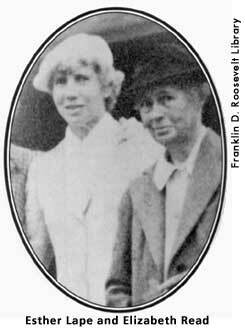 Lash, Joseph P. Love, Eleanor: Eleanor Roosevelt and Her Friends. Garden City, New York: Doubleday & Co., 1982, 79. Norton, Mary Beth, Katzman, et al. A People and A Nation: A History of the United States. Boston: Houghton Mifflin Co., 2001, 657.